Hydraulic equipments or more widely hydraulic power is used in almost every sector of today’s society, be it agriculture, construction, engineering, manufacturing, defense, servicing to marine; the use of hydraulic power is not hard to find around us. Hydraulic adaptors play a very important role for providing joints between multiple parts of hydraulic equipments to give it a multiple functionality feature. It is basically a metal point of joint which is usually male to male connect from both the ends and is threaded from ends for the purpose of connectivity. Hydraulic adaptors have a very diversified market and we at Flexotech Products have a wide range of adaptors which can be used in multiple equipments and for multiple functions and we have a large ready stock of standard adaptors which can be shipped in very less time. Due to our experience and expertise we can also manufacture adaptors as per the requirement and specification provided by the client. 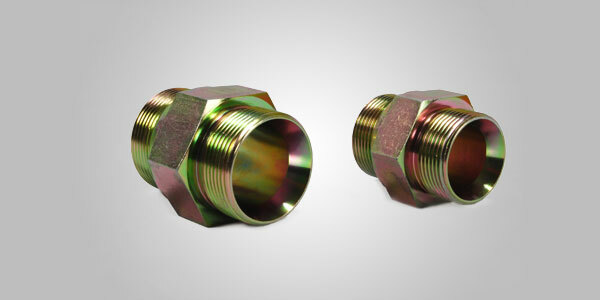 Hydraulic adaptors manufactured by us goes through a stringent quality check and from a long time they are known for their endurance, durability and high quality which ultimately is evident in the form of long lasting efficiency of the equipments. Our quality product backed by our unmatched customer client service and technical help to the client gives us an advantage over others in the industry.